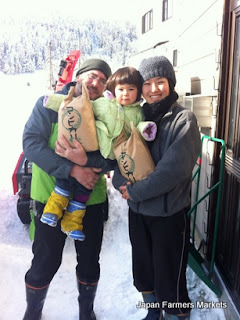 Our friends at One Life Japan and their yummy rice. Shameless marketing on my part, but it's really good. However, on the to the relevant stuff here: Tokyo farmers markets! OK, the selection is small but excellent this weekend. The Earth Day Market is also hosting a ceramics show, so plan to find something to go with those awesome vegetables and fruits. The UNU Market will rock it as always, so just plan to have fun. A visit last weekend to the Yurakucho Market found it still going strong and brimming with awesome items. It's seriously worth the journey. And, lest I leave them out, the Saturday Roppongi Market is on and awesome as ever, too. An extended interview with the manager in preparation for an article only deepened my affection for that little spot. I have found something in Roppongi to love, and it's a farmers market. See you at the market! Wow, what a change from our local markets here in the heat! So fun to bump into Mr L B at Earth Day Market, but I missed Mrs. I bet you were busy interviewing someone, do hope to read about it here. Your blog is such an inspiration. Keep it up, Joan, we need resources like this. Yeah! I'm glad it was useful. But I'm sorry I missed seeing you. Perhaps next time? We'll be back in March. And I'm sure it is quite a change from the heat down under. You're always welcome here to cool your heels a bit!